Iodothyronine deiodinases play an important role in thyroid hormone regulation in vertebrates. The aim of this study was to clone type II (SgD2) and type III (SgD3) iodothyronine deiodinase cDNA from the goldlined spinefoot (Siganus guttatus) using 3′- and 5′-rapid amplification of cDNA ends and then to assess their expression patterns in the liver under several experimental conditions by using quantitative real-time PCR. SgD2 (1013 bp) and SgD3 (1492 bp) contained open reading frames of 810 and 804 bp and encoded 270 and 269 amino acids, respectively. They were characterized by an in-frame TGA codon that was considered to be selenocysteine. An abundance of SgD2 and SgD3 mRNA was expressed in several tissues, with an increase at 1200 hours and a decrease at 2400 hours. Food deprivation suppressed the expression of SgD2, but not SgD3. 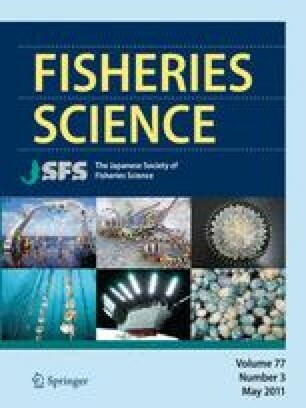 Higher SgD2 and SgD3 mRNA levels in the liver were found in fish reared at 25°C than in those reared at 20 and 30°C. These results suggest that exogenous factors influence the mRNA levels of iodothyronine deiodinase genes in the liver and that transcription of the genes in certain tissues is partially regulated in a circadian manner. This study was supported in part by a Grant-in-Aid for Scientific Research from the Japan Society for the Promotion of Science (JSPS) and a Joint Research Project under the Japan–Korea Basic Scientific Cooperation Program from JSPS to AT.